Oracle Band News and Information: Oracle Returns to Perry's Restaurant this Friday!!! Oracle Returns to Perry's Restaurant this Friday!!! This coming Friday, March 23rd Oracle will be returning to Perry's Restaurant for our first performance there for 2012. Perry's Restaurant is near and dear to our hearts as it is one of the first venues that started to book Oracle way back in our infancy. They took a chance with us, and here we are twelve years later packing the place to standing room only. Of course a lot has changed over those 12 years. Whereas we were a 3 piece band all guitar band back then, today we are a six piece band where we don't even all fit onto the stage. Hey...it doesn't matter, we still look forward to these appearances and enjoy every minute performing. We do a fair amount of reminiscing as well! The show starts at 9:00 and we play until 1:00 in the morning. Best of all, there is absolutely NO COVER CHARGE!!! Perry's Restaurant is very easy to get to. Centrally located in the heart of Odenton Maryland, it is only 10 minutes from I-95, very close to Laurel and Fort Meade. Heck, now that the ICC is open, you can be there in 50 minutes even from Montgomery County! If you want to sit we'd urge you to get there early, or at least have one person get there early to stake out a table. The food is really good, particularly if you have a liking for Greek fare! They have an entire page of Greek menu items, including Gyros, Souvlaki, some delicious lamb entrees, and of course don't forget the Baklava! Their seafood and steaks are excellent as well. 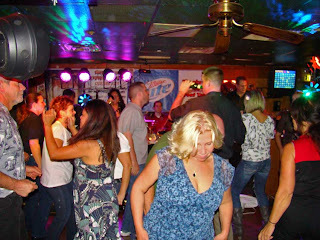 Want to see what an evening at Perry's is like? Here's a little video clip from October of last year. As you can see the dance floor is rocking and everyone is having a great time. Hope you can come out to make this Friday another memorable experience!! !